Gauley River rafters with River Expeditions enjoy lunch while watching paddlers run Sweets Falls rapid. You don’t need a passport to experience world-class whitewater rafting—it’s available on the legendary Gauley River in West Virginia, but only for four more weeks. 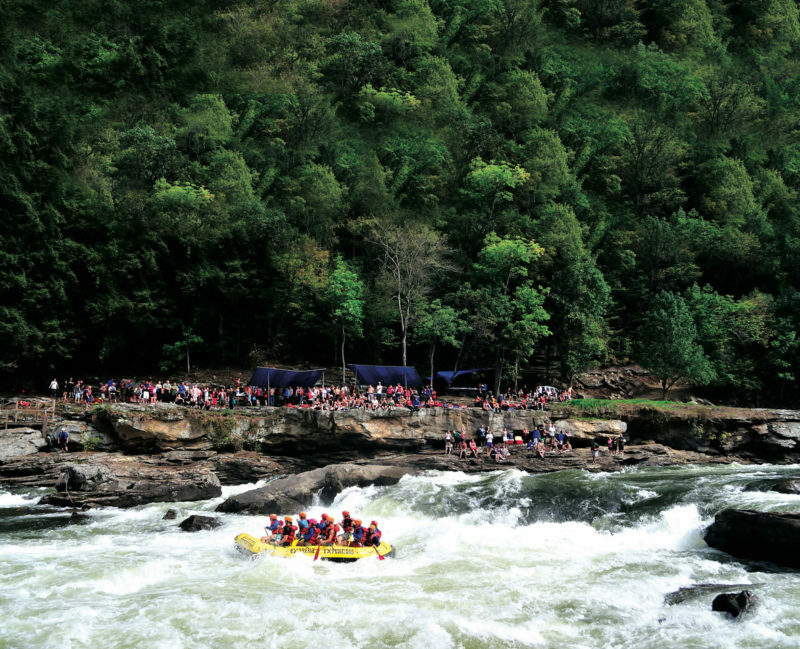 Designated by the National Park Service as a the centerpiece of a national recreation area, the Gauley is touted as “one of the most adventurous whitewater-boating rivers in the United States,” according to Rick Johnson, co-owner of River Expeditions. Johnson says the autumn rafting season on Gauley is among the best times to experience the thrill of rafting for beginners and advanced paddlers alike. “We love to showcase the Gauley River in fall. Our guests really appreciate our exclusive lunch spot at Sweet’s Falls—one of the biggest rapids on the Upper Gauley,” Johnson said. Two distinct sections of the 25-mile stretch offer trips for beginner-to-advanced paddlers. The Lower Gauley is wild and scenic with rapids for those age 12 years and older with no rafting experience required. The Upper Gauley is truly world class rafting for those age 16 years and older with previous whitewater experience strongly recommended. This is the most intense section of whitewater available, Johnson said. If you go, choose a professional rafting outfitter like River Expeditions, which is family owned and operated, to host your adventure. Learn more about rafting on the Gauley River, and let them help determine which trip is best for you. In addition to whitewater rafting, River Expeditions offers cabin rentals as well as tent camping, RV sites, hiking trails, lodge, zipline tours, outdoor pool, gift shop, paintball course, disc golf, saloon and other distinct amenities. Special travel packages are available through the end of the season, like buy-one, get-one-free 1/2 every Friday and Monday. For more information on the Gauley River, call 800-463-9873 or email info@raftinginfo.com.